Apple released its Best of 2014 list of apps, games, movies and TV shows this week and now it’s Google’s turn. The two lists are very different since Apple curated their list while Google just looked at the download numbers for its apps, movies, and shows. Google split its top apps of 2014 into eight categories so there’s an eclectic group. Duolingo wins for the education category. Facebook, of course, wins for the Social category. Pandora remains victorious over the hugely popular Spotify app because of its intelligent radio stations. Netflix is also unsurprisingly the most downloaded entertainment app of the year. 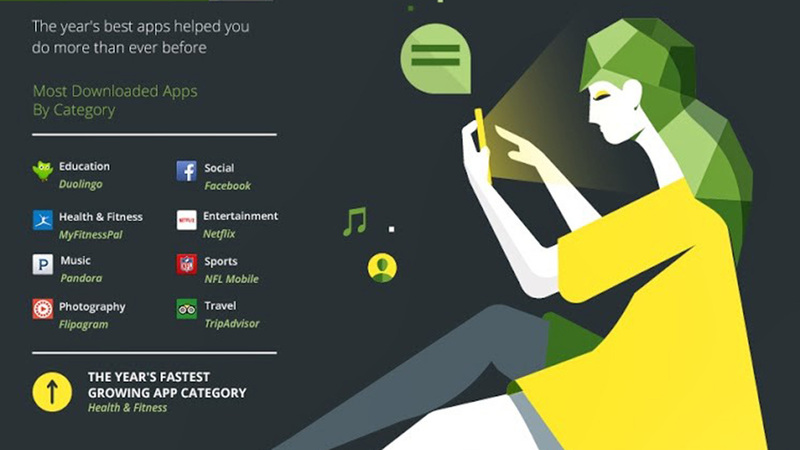 TripAdvisor wins for the most downloaded Travel app. There were a couple of surprising apps that I haven’t heard about before in this list. Flipagram wins in the Photography category. The app lets you create short videos and send photos and music to your friends. The app looks like an Instagram clone but with more features. MyFitnessPal wins in the Health & Fitness category for its in-depth fitness tracking features. It’s free but ad supported. For games, King’s Candy Crush Saga was the most downloaded. Don’t Tap The White Tile, an addictive game where you tap only black tiles as quickly as possible takes runner up. More free-to-play titles like Farm Heroes Saga, Subway Surfers, and Clash of Clans made the list. Apparently Android users don’t like paying for games since these are all free titles with in-app purchases. For a full list of winners, check out Google’s massive infographic below.